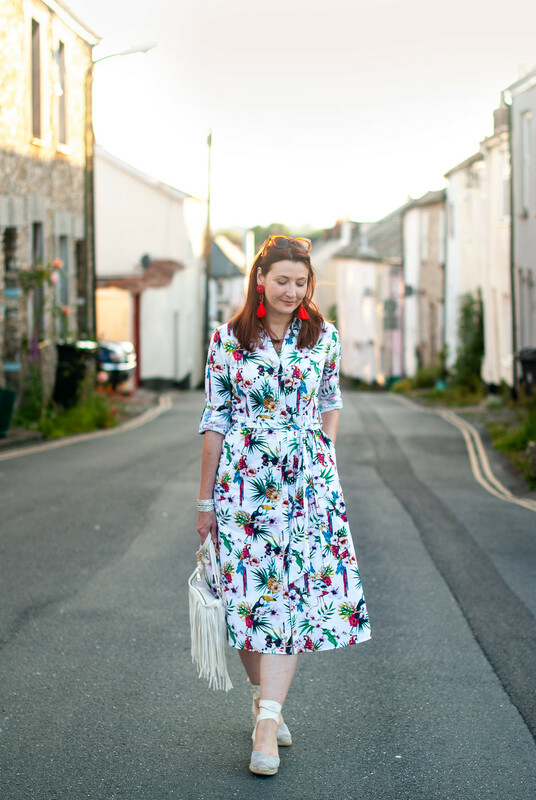 If you’re sick of florals in summer I make no apologies for this dress – it’s a floral print, but definitely not your average floral. It’s got parrots, toucans, flamingoes, budgies (I think?) and pineapples. And that’s before the flowers…! 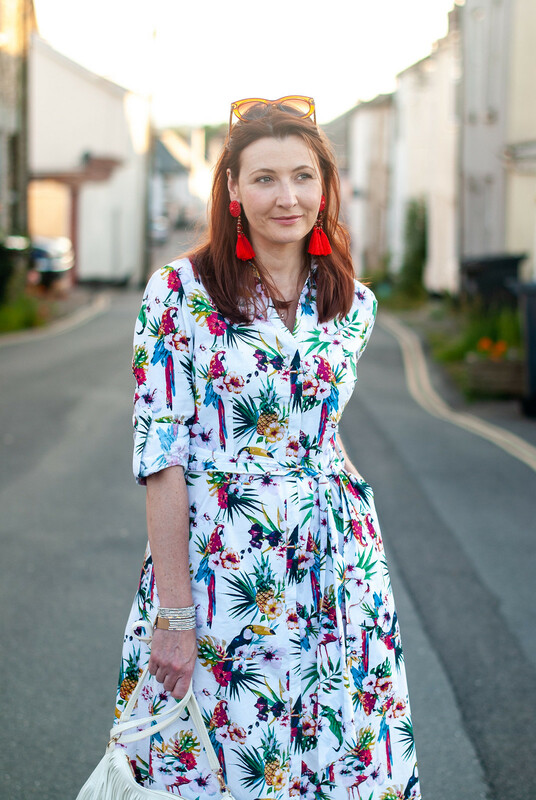 I’d had my eye on this tropical print midi dress from Marks & Spencer for such a long time – I’m not sure why I didn’t snap it up earlier but I think it was because I was waiting for warmer weather to really kick in. Now we seem to be having some regular, gloriously sunny days [don’t jinx it Catherine, don’t jinx it], I think it’ll see the light of day several times this summer. I’ve worn it a couple of times already – once to the Dove spa break in Bath and once the other weekend at a family barbeque. It’s 100% cotton and the perfect midi length (a proper midi, not this knee-length nonsense some retailers advertise!) and it has long sleeves which can be rolled up with those handy button-strap thingies that a lot of shirts and dresses have these days. Both times I wore the dress it got a ton of compliments, even making my florals-hating friend Lisa AKA The Sequinist die over its loud, in-your-faceness. Something she said that made me think: She asked how I seemed to always find the best of M&S every time. Unlike some people I seem to love so many of the things they bring out each season and to be honest I could spend a fortune there (except their prices are so reasonable it probably wouldn’t add up to that much anyway). So if you’ve dissed them in the past, I urge you to take another look! 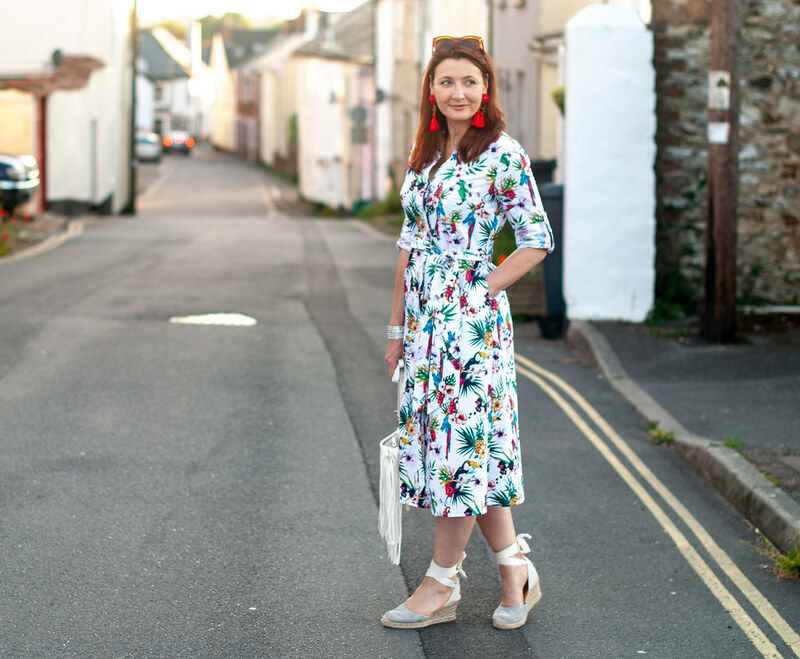 I wore the dress with my new grey wedge espadrilles that were kindly gifted to me from Espadrille.co.uk – they were actually a gift to cheer me up following my operation in January (bless them)! They have every colour under the sun with all the heel heights, fabrics and ribbons/straps you could want. They’re a little pricier than your usual high street version, but since when do espadrilles date…? I think I’m going to live in dresses this summer. For some reason trousers just aren’t doing it for me, you know?! 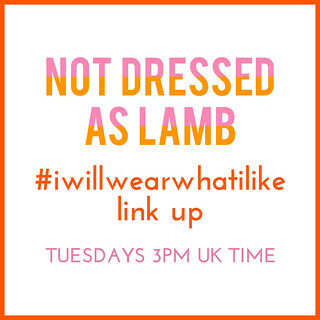 ARE YOU HAVING A DRESSES MOMENT LIKE ME RIGHT NOW? COMMENT BELOW…! This dress is absolutely gorgeous, and I love how different it is. Very grown-up but in a good way. Love the dress. So cheerful. Makes me happy to look at you. Would totally be a dress for me as well. I do live in trousers and I really should do skirts and dresses more often as I like those too. Hmmm. Monday is salary time. Let’s see whether a visit to M&S is possible. I love the way you chose to style your tropical dress! Your style is super unique and your accessories are stunning. Such a fab dress, love the cut and print a lot! Pineapples and parrots, so tropical and fun, will be fab for holidays too! Agree M&S have plenty of hidden treasures, I feel like this year they’ve gone a bit “young” with some things so am actually being thrifty and wating for the sales if possible! 😉 I really like your white fringe bag with it too, is that older? This dress is beautiful, I love the print. And those shoes are absolutely adorable. What a stunning dress. I have not seen it in Marks and Spencer. Maybe you do find the best items. What a fun dress! Love the explosion of color and pattern. That’s such a pretty dress, Catherine! I don’t wear dresses very often, but I just got one, and I can’t wait to wear it! Im loving your dress… well of course I am its colourful, cheery and suits you down to the ground! Nothing wrong with florals anyway? who can ever be sick of flowers on dresses? 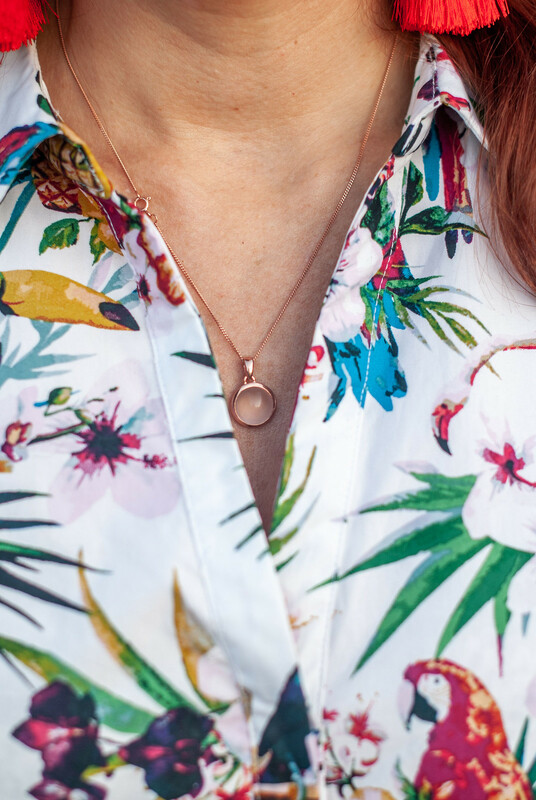 I think, when it comes to florals, the bigger the better – or the crazier the better! So I happen to LOVE this dress. It’s pure perfection for the summer too. Gorgeous! 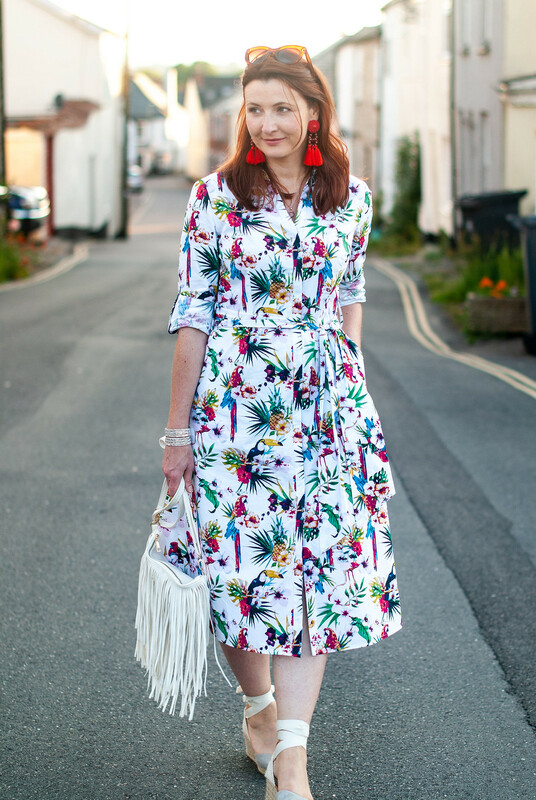 I have been wearing quite a lot of florals recently and thought I need a break… until I saw this dress on you, Catherine! Might have to reconsider!! Love the combination with espadrilles, they are a must have for summer, aren’t they? 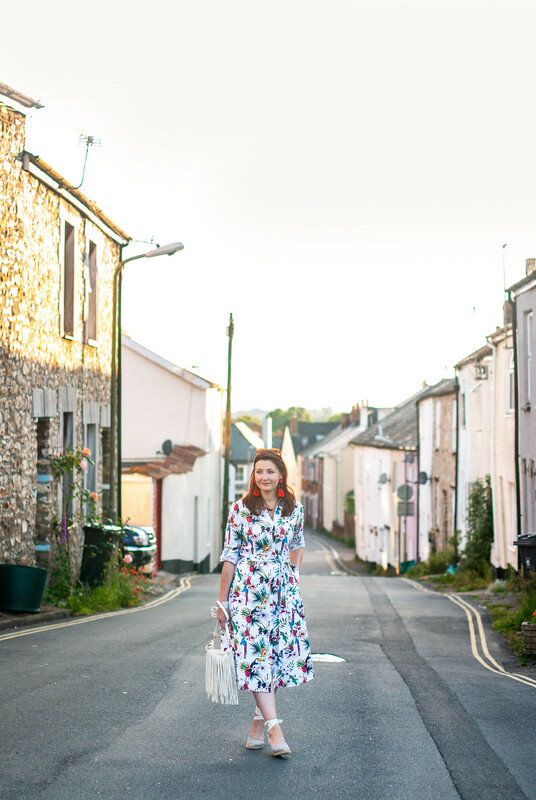 I love florals, and yes it does have to be a large print (small scale always reminds me of Laura Ashley in the 70s). Just bought a top and trouser set that looks like a jumpsuit when paired together! I am over the pond sitting by a beautiful lake wearing:wait for it a dress. How fun! I love a whimsical print! 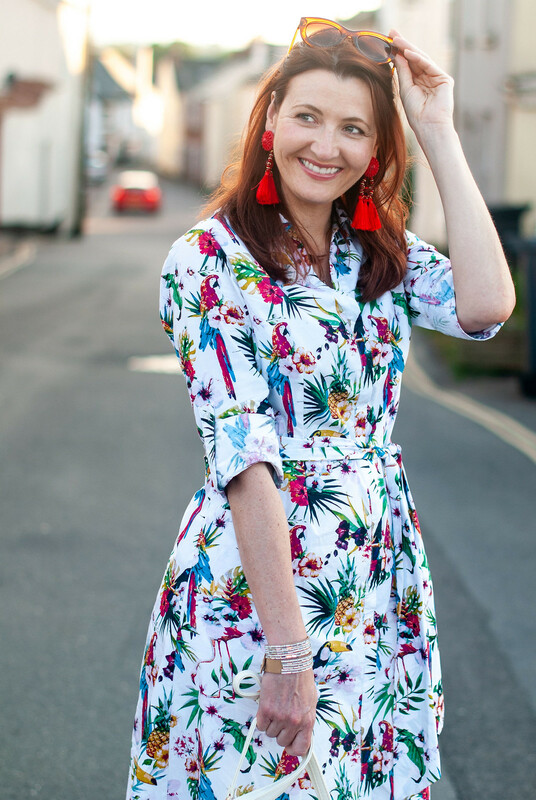 Several years ago i had a green dress with parrots all over it, I loved wearing it – but such a distinctive print got old pretty quick for me so after two summers it was out. Love all your styling – red tassle earrings, fringed bag and ankle-tied espadrilles. You look great! hehe thank you Joi!! It’s your kind of pattern, no…?!! 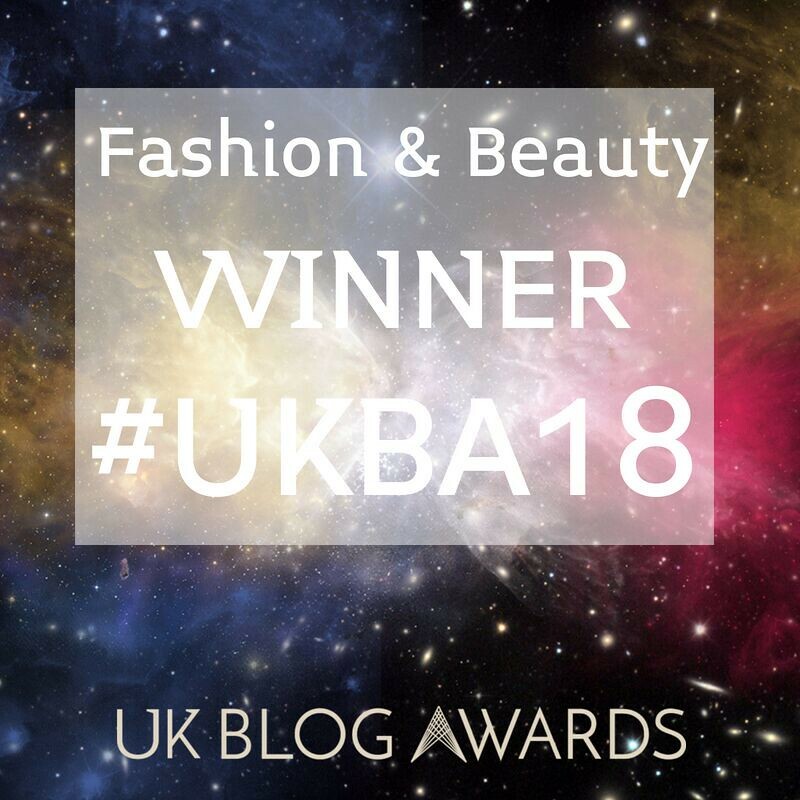 I actually am having a dress moment as well! Usually you’ll find me in jeans, but there are so many great dresses to choose from right now! The one you are wearing is fabulous…I love the bright colors and the fun print. You’ve accessorized it beautifully here! 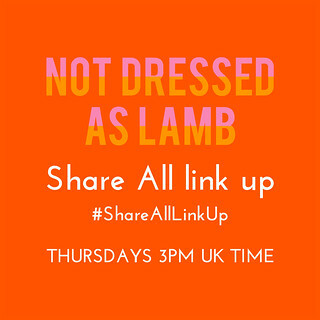 Thanks so much for the link up! Have a great day! Wow! That dress is stunning and you styled it beautifully! I’m a bird lover, so I’m really drawn to the birds in the print. Me too, Amy – I think it would make a crazy beautiful wallpaper!! 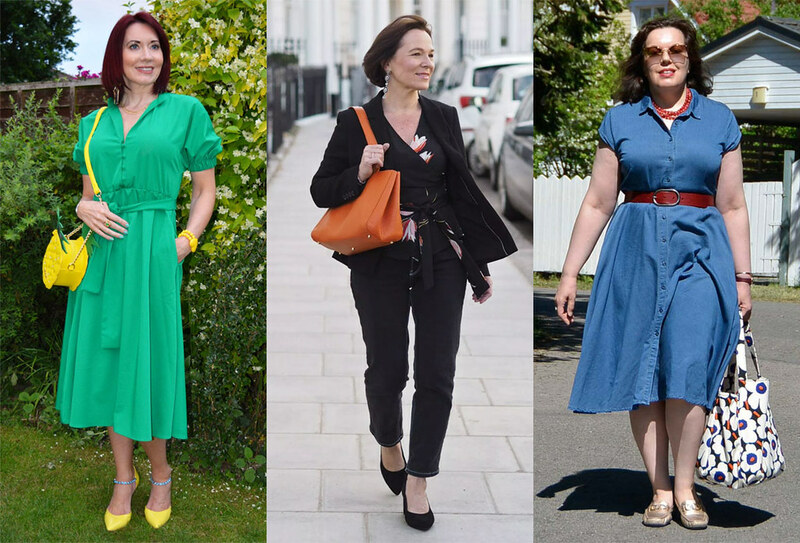 Your dress looks so fresh and contemporary that my knee length dresses look dated – so I’m scouring the shops to find a midi dress with oomph. Agree with you on M&S. If you look frequently at their new stuff on the app, you find some great things! Yyyyep! Today I’m wearing my green Seasalt dress. Lovely long sleeves, v-neck and leafy pattern. Your Seasalt campaign worked for me. Oh wow that’s lovely to hear, thanks Emerald! 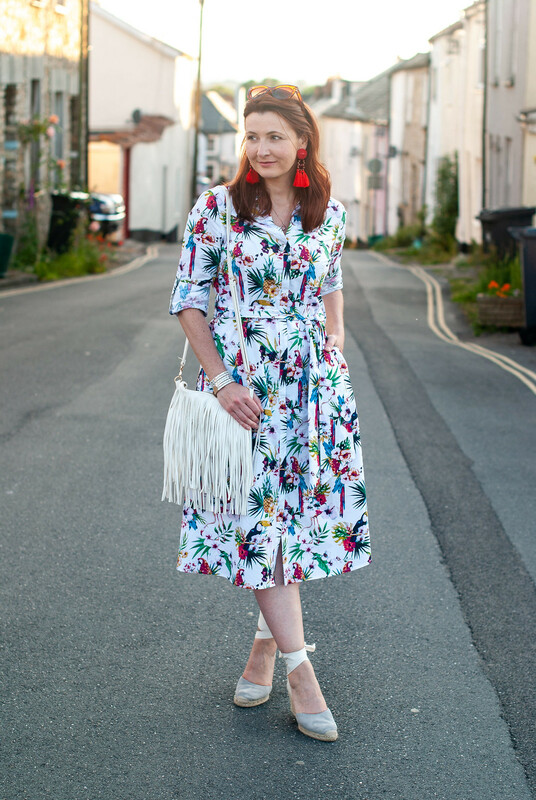 I think I find them because I’m always looking for alternatives for my other outfit posts, Porcelina – this dress featured in my favourite spring outfits post in April(?) when I looked for alternative floral dresses for another M&S midi dress beauty I bought last year. I just add them to my favourites then obviously go back to them over and over until I eventually cave..!! Thanks Maria – it’s a more colourful change from the usual green botanical prints I thought! Catherine that tropical print dress looks just wonderful . I’m not really a floral print fan but the fact that this is strong and bright makes it so appealing . Perfect with the espadrilles. Many thanks for hosting. That dress is freaking amazing. I love an over-the-top tropical print. Your red tassel earrings are to-die-for too! I love fabric with birds! This is so cute! You do find the best pieces, Catherine!! And I totally agree that summer is made for dresses!! That dress is a true show stopper. I love the pattern, the style. It is a gorgeous dress. We have a M&S in the Netherlands although I wonder if they are the same. I do know one in Hastings so I will pay them a visit in August! Great dress and what a lovely bag and espadrilles! The grey is different, love it. Thanks Nancy! It’ll be interesting to know if there ARE differences…!